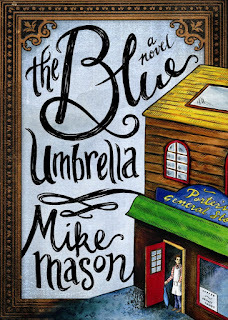 I recently had the opportunity to read a delightful children's book, The Blue Umbrella by Mike Mason. It is the story of Zac Spark's, a boy who is sent to live with his Aunties when his mother dies. He encounters a cast of unbelievable characters and is unsure who to trust. The book reminds me a lot of the Lemony Snicket books. It is a fantastic read that my children and I really enjoyed. We give it two thumbs up! Check out the trailer below. The Blue Umbrella, by Mike Mason from David C. Cook on Vimeo. What would happen if all the world’s weather was controlled by one man with a blue umbrella? If your mother had been killed by lightning, would you trust this man? This is the decision facing 10-year-old Zac Sparks in Mike Mason’s new page-turning fantasy novel, The Blue Umbrella (David C Cook, October 2009). Probing the depths of good and evil, the first in Mason’s series for 9 to 12 year olds is a superbly written children’s story with deep spiritual resonance. When Zac Sparks’ mother dies, he’s sent to live in Five Corners with his cruel old Aunties. It isn’t long before Zac knows something strange is going on. Five Corners is populated with weird characters—a midget butler, a girl who doesn’t speak, a blind balloon seller, and a mysterious singer who is heard but not seen. Then there’s the Aunties’ father, Dada. Zac’s first encounter with Dada is so terrifying he faints dead away.